A link to the past no one could ever imagine. 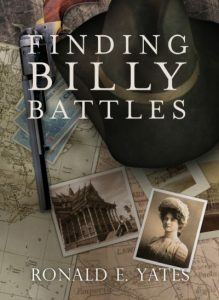 But most of all he learns that in finding Billy Battles he has also found a long lost and astonishing link to the past. I grew up in Kansas and I was always fascinated by what life was like there in the 19th Century when the state was still quite wild. At the same time, I spent a lot of time in the Far East as a foreign correspondent and I was equally intrigued by what life must have been like in the 19th Century colonial period in places like French Indochina, The Philippines, Malaysia, Singapore, Hong Kong, etc. Then one day I got the idea to blend the two using a character from 19th Century Kansas who goes to the Far East in search of himself. I call my work "Faction," because it is both fact and fiction. Some of the events in the book–especially those dealing with real people, did happen. Was my character directly involved in them? No. However, members of my family were native Kansans and some of the experiences I write about did happen. I also used many of the expressions and adages I heard my great-grandparents, grand-parents, uncles, aunts, cousins, and even my parents use when I was growing up in Kansas. I also have woven some of my experiences covering war and revolution in Asia and Latin America into the story line also. My full name is William Fitzroy Raglan Battles, but most folks call me Billy Battles. My good friends call me Billy "Rags" Battles. More on that later. Let me begin by owning up to some pretty terrible things I did during my life. That way, you can make up your mind right now if you want to read further. I have killed people. And I am sad to say the first person I killed was a woman. It was entirely unintentional, and to this day, the incident haunts me. The next person I killed was that woman's grown son, and that was intentional. If you decide to read on, you will learn more about these two people and how they came to die at my hands. You will also learn about other things I did—some of which I am not proud of, some of which I am. In the course of my life, I got into a lot of brawls where I had to defend myself and others in a variety of ways. I did so without regret, because in each case, someone was trying to do me or someone else harm. Now I know the Christian Bible says it is a sin to kill, and in some of these imbroglios, I probably could have walked away and avoided the ensuing violence. I chose not to because I learned early in my life that walking away from a scrap is too often seen as a sign of weakness or cowardice and simply incites bullies and thugs to molest you later on. There were a few individuals who tried their damndest to put an end to me, but fortunately, I was able to dispatch or incapacitate those malefactors before they could apply the coup de grâce. So there you have it—a forewarning about me and my sometimes-turbulent life. As the Romans used to say, "Caveat emptor," if you decide to continue reading. I don't know if anybody will ever read what I am putting to paper here, but I figure I should do it anyway. A few folks have told me my experiences are fascinating because they show what it was like in Kansas and a lot of other places in the last century, when life could turn violent and capricious without warning. As I am writing this, I am eighty-eight years old, and the year is 1948. I am not sure how much longer I will be on this earth, so I figure I had better write pretty fast before I join the Great Majority. I have been fortunate in that my memory still serves me quite well, but I must admit that for much of my life, I kept several journals, and it's those journals that have kept my mind on the trail when it was inclined to wander off into the brush. It's also those journals that helped me make sense, now that I am an old man, of some of the things I saw and did during my life. It's a funny thing, but as you grow older and you have time to look back on your life, things begin to make more sense to you. I guess that's what they call wisdom—not that I'm necessarily a wise man. I'm just somebody who had the good fortune to see and do a lot of things—some pretty awful, some pretty wonderful—and the good Lord has blessed me, or cursed me, with the capacity to remember most of them. There are some things I wish I could forget—things other people did and things that I did. But I cannot. Consequently, I have lived for decades with many ghosts—not the kind that appear as apparitions in the night, but the kind that grab hold of your mind and force you to remember even when you don't want to. I know what it is like to be a hunter of men, and I know what it is like to be hunted. I can tell you, I much prefer the former over the latter. I have known and caused terrible fear. I have experienced and inflicted dreadful pain. I have loved and been loved, and I have been, without doubt, hated by some. But I have always tried to live my life as my mother taught me—with uprightness, reliability, and consequence. I wasn't always successful. Sometimes my disposition turned dark, and I did things I truly regret today. I am, after all, one of God's wretched creatures—a simple mortal with all the imperfections and deficiencies of that species. Now, I don't claim that my life was any more important than anybody else's. Most folks who lived in the nineteenth century had their share of adventures—some more than others. But what I think is important is that the truth about certain things be told—or at least the truth as I witnessed it in those days. There has been so much fiction and fabrication passed along as fact about things that happened in places like Kansas, Oklahoma, Missouri, Arizona, Colorado, and so on that people today have no real idea of what really went on back then. For example, the moving-picture people have gotten it almost all wrong—not that they were ever trying to get it right. After all, they are in the entertainment business—not the truth-telling business. They have made some folks so much bigger than life that I have trouble figuring out if they are talking about the same people I used to know or had some acquaintance with. And some folks have been either forgotten or turned into the worst kind of villains. I am not sure which is worse. Hell, they even got a lot of our history wrong. The Spanish-American War, for example. A lot of that was fought in the Far East, and most Americans don't even know it. I know it because I was there fighting in the Philippines. That is a dark chapter in our history, I can tell you. I was also privileged to have spent time in other parts of the Orient at a time when that part of the world was still pretty exotic and mysterious to most Americans. And that's not all. There was a lot of skirmishing later on down in Mexico that we were mixed up in after Doroteo Arango, alias Pancho Villa, and his little army invaded the United States back in 1915. He led the U.S. Army on a merry chase throughout Mexico and leveled an American town in New Mexico. The late General George S. Patton (in those days just a shave tail lieutenant) even brought back the body of the commander of Villa's bodyguards tied to the hood of his car like a big buck deer. I know that, because I was there. But I wager students today don't read anything about any of that in school. The folks in Hollywood and those who write books and radio programs have added so much twaddle and claptrap to things that happened that I sometimes have to ask myself if I missed something. Because what they are depicting is so far away from the truth as to be mythology. I never thought much about that until now, when I realized that all the rubbish `coming out of Hollywood and over the radio and in books and magazines and on these new contraptions called televisions is being passed off, or at least being accepted, as fact. Sometimes we just don't see things the way they really are until we can stand back from them and look at them with the viewpoint of time and distance. That's what a professor at the University of Kansas once told me when I was a student there for a while back in the 1870s. I never finished my college education—a fact that troubled my mother until her dying day. Nevertheless, I learned just enough at that place to be a modest man of letters, but not enough to be a danger to anyone or myself, except on a few singular occasions. My time at college may have been the two most important years of my life because it gave me a leg up on a lot of folks back then who couldn't read or write or study things out in a logical way. I was no warrior. Never wanted to be. Nevertheless, I got pushed or pulled into some regretful scraps. I did serve a hitch in the army, and that was a true adventure. In fact, I was a scribbler, a newspaperman for most of my life. But in those days, there were no precise lines between journalists and the people they were writing about. I was just fortunate that I was able to write about what I saw and what I experienced. Not many men or, for that matter, women, in those days had that opportunity. I consider myself most fortunate in that regard. Now that my life is drawing to a close, I am eager to put as much of it to paper as I can. Maybe someday my descendants will be able to pass it on to their children, and they to their children. Even better would be if a larger audience might read it, but I am not an author of great literary works, so I cannot expect that to happen. I guess my modest wish is that I be able to share what I humbly regard as an eventful life with those who follow me and anybody else who might pick up these pages. But mostly, I want to set the record straight on a few things and about some of the people I got to know when I was much younger. My life started off pretty slow, like most lives do. There was nothing special about my childhood years except for the fact that I had no father and it was up to my mother to keep me on a short leash. But about the time I hit eighteen or nineteen, things got to moving pretty fast—faster in fact than I ever thought possible. It was around that time that I met some folks, some good and some not so good, who would reenter my life many times over the next several decades. And it was around that time that I began my journey down the owl hoot trail. But I am getting ahead of myself. I had best start from the beginning.